Quezon City – Literally, "Merry Christmas" in Tagalog! Have you ever celebrated the most festive time of the year in the Philippines? If yes, then you know that it is difficult to be sad when everyone around you is in a joyful vibe and in a celebratory mood. Parties and family reunions are happening everywhere, employees get their Christmas bonuses and 13th month pay, and everyone is gift-giving. Colder nights and shorter days are reminders for all Filipinos that the Yuletide season is just a few months away. Christmas is a happy time for every local, with the festivities lasting longer than anywhere else in the world. Many Overseas Filipino Workers (OFWs) or Filipinos residing abroad rush home and travel miles away to spend Christmas with their families. This is a special time where families come together to bond, share, and connect with those closest to us. Lavish light displays are evident all over the city as early as September, and Christmas songs are already part of weekly playlists of radio stations. Christianity is a major religion in the country, thus, many Filipinos wake up very early to attend the novena mass, also known as the Misa de Gallo starting from December 16th up until Christmas. Shops and supermarkets in the major malls are usually packed as people buy presents and groceries for the big day, while traffic grinds to a halt, especially on weekends. A parol, or a Christmas lantern shaped like a five-pointed star that serves as a light at night, can be found lining every street in the province. These Christmas lanterns are used as ornaments in most houses, where they are displayed either in the window or by the door along with a crèche or a nativity scene called belen. Of course, snacks such as purple-colored rice pastry (puto bumbong), flour and egg cakes (bibingka), and the local version of hot chocolate (tsokolate) are all available for those who crave these Christmas delicacies. 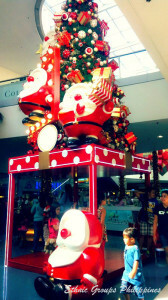 One indication of how much Filipinos love Christmas season is a yearly festival in the city of San Fernando, Pampanga. The Giant Lantern Festival of Pampanga is an annual tradition that dates back 80 years. Giant lanterns that measure up to 20 feet made up of thousands of lights in different colors dance to the tune of Christmas carols as well as novelty songs. As the primary source of giant lanterns in the country, the city came to be known as the "Christmas Capital of the Philippines." The city of Tangub located in the northern part of Mindanao, the second largest island, has drawn locals and tourists alike for more than twenty years. Dubbed as the "Christmas Symbols Capital of the Philippines," the city's government center and public plaza are bathed with city lights and colors for the entire month of December until the first week of January, transforming the city into a theme park. Schools, barangays, and businesses work together to put up different attractions as they also compete for the most beautiful display. The festival attracts thousands of families every year, including tourists who want to witness the abundant display of stunning lights. The Christmas lantern or parol is an iconic symbol of the Filipino Christmas spirit, a representation of shared faith and hope, and a symbol of the triumph of light over darkness. It is hung outside the house to signify the star of Bethlehem that guided the Three Wise Men to the manger of the newborn Jesus Christ. Christianity spread in the Philippines during the Spanish occupation, which was also when lanterns were used to light the way to church for people attending midnight masses. Traditionally made of bamboo sticks, Japanese and crepe paper, and a candle for light, today’s lanterns are now made of plastic or Capiz shells. Spending time with family is among the most anticipated activities during Christmas, as family reunions are where family and relatives who haven't seen each other for a long time are all present to enjoy each other’s company. Family reunions or big kin gatherings happen only once a year or every few years. A variety of food is especially prepared by the assigned cook of the family. Otherwise, a potluck party is always an alternative. Children open their gifts on Christmas Eve, while most adults take pleasure in Monito/Monita, the simple tradition of gift-giving among family and friends. Nelia, whose family has been based in Chicago since the 1990s, makes sure she comes home to the Philippines to spend Christmas. “Big cities like Manila may seem chaotic during this day, but none of those can prevent us to enjoy the season. Traffic may seem endless, especially when Christmas draws closer but there is no place like home. The vibe here at this time is just very welcoming and alive compared in the US,” she added. For Jhonna, an insurance manager in Makati, the province is still her best option. “Our Christmas is spent almost every year in Dumaguete, where my parents live. Nothing beats Christmas where I grew up. Even though the people don’t have much, they are still happy. I personally look forward to our yearly family reunion where all of us cousins rent a karaoke machine and sing till we drop. There’s nothing better than being surrounded by all your loved ones during such a joyous time,” she mentioned. The cold days of Christmas lure us to our favorite high-calorie foods that are abundant during this season. Filipinos tend to prepare high-fat foods on Christmas such as pastries, pasta, and cookies, not to mention candies and chocolates sent from family members abroad. Through the years, the lip-smacking roasted pig or lechon has been a vital part of every home’s table in big get-togethers. This might be one of the many reasons why Filipinos are especially jovial this season, as according to medical studies, the brain actually produces feelings of happiness when high-calorie or high fat food is consumed. Above all, more than the magnificent decor and trappings around the country, the Filipino Christmas spirit is heartwarming. For many Filipinos, it is the season of giving and showing their loved ones how important they are. It is about family unity and the joy of being together. Whether it’s a simple or lavish celebration, Filipinos are happy to be able to spend it with the people closest to their hearts. Many OFWs who can’t be with their families at this time of year usually burn the telephone lines or talk through the Internet. It is indeed a Christmas like no other!